Doppler Photo: Photos and stories by Omari Stephens: So I'm Just This Guy, Y'Know? Hi, I'm Omari. My friend Mike Spinak put a tiny seed in my head when he posted a self-portrait for the #UnalteredBeauty hashtag on G+ earlier "today" (Saturday). The seed finally took root as I was walking from my car ~9 hours later, having just gotten home around 3:15 am, and carrying a toolbox and cotton film gloves in one hand, and a new print in the other: "you know, it'd be nice to get a picture of this moment." 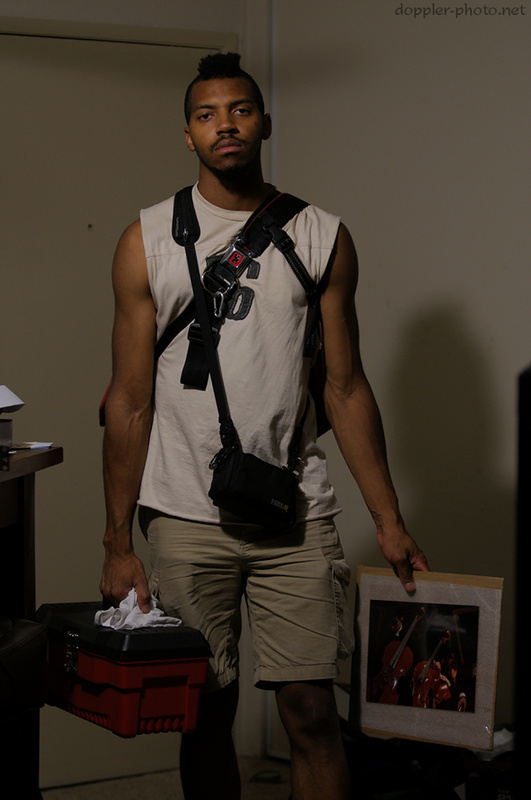 Since there was only one photographer in attendance, I decided to make an environmental (self) portrait. After an hour of futzing and tweaking, I came up with the shot that you see. I think it turned out well, and beyond all else, it's accurate. I woke up at 8:30 Saturday morning to have time to pick up my friend Joyce in time to help my friend Mo move. After schedules shuffled, I worked on my ALMS post for a bit (coming any day now, y'all), and then took off. I brought all of my tools and rope, just in case we needed to hoist Mo's new couch in through the balcony. Got there and started helping carry boxes inside. Turns out that that's tiring when it's 32°C/90°F out. We went to Ikea, had lunch, and then went shopping. POÄNG is super comfy :o) After a stop at Cost Plus World Market to pick up some dishware and the couch, we went back and unloaded stuff again. Joyce had a few prints of mine that she wanted to get framed (including my favorite cello photo ever, so I got myself one also) so we left for Bay Frames pretty soon thereafter. We spent about an hour-and-a-half poring through the various mouldings, and puzzling over which mats worked, and if something slightly darker / maybe a bit cooler / actually, a little brighter / hmm; warmer? / more green / no, actually, more gray / etc. would work best. After making final selections and leaving the framers', I dropped Joyce off for an engagement and went back to help Mo et al. assemble the Ikea furniture. I feel like I got a workout just from driving so many screws and bolts, but thus is the nature of Ikea assembly. After building stuff, chatting for a bit, leavi^Wchatting a bit more, and finally leaving, I made it home around 3:15 am, at which point the aforementioned thought struck. So, anyway, I'm just this guy, y'know? Kinda quirky, with a bunch of hobbies, but I love being me.